Cigarettes are one of the most dangerous commodities for health, but are sold freely and can be obtained easily. Not only can be obtained easily, according to data from the Association of Indonesian Public Health Expert or IAKMI, 51.1 percent of Indonesian people are active smokers. This is the highest number in Southeast Asia. Smoking itself has been shown to cause some dangerous diseases such as chronic obstructive pulmonary disease, lung cancer, heart attacks, as well as many other diseases. This is because cigarettes contain harmful chemicals such as nicotine, tar, cyanide, benzene, cadmium, methanol, ammonia, arsenic, and carbon monoxide. This is what makes people want to quit smoking, and look for effective ways to stop smoking. How not, the dangers of cigarettes risk lurking you in the future so the way to stop smoking should be done immediately. If you want to quit smoking, here are some ways to quit smoking. How to stop smoking is diverse, but the main key back to your own consciousness to immediately leave this dangerous habit. There are some products that are deliberately intended to be a substitute for cigarettes. Various products are referred to as Nicotine Replacement Therapy or NRT, you can rarely get it freely. Because you need to come to a therapy session in a psychiatrist or a professional in his field to get this product as prescribed recipe. Here's how to stop smoking by using a cigarette replacement product that can be selected. 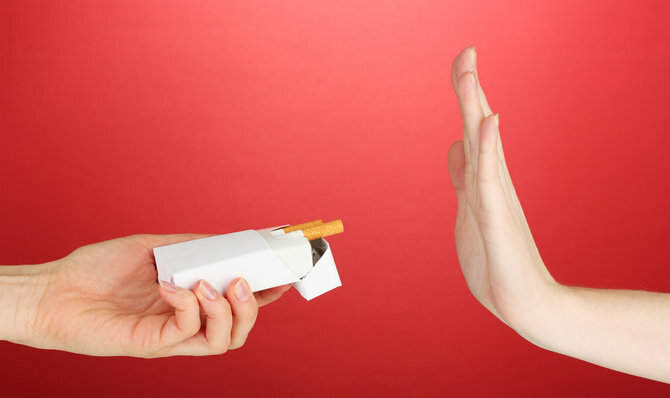 Here are some tips that you can apply as a natural way to stop smoking. 2. Look for words that could be "automatic suggestions" when you will be tempted to smoke. For example "if I'm tempted, when do I stop?" or simply, "I do not smoke". 3. Reduce caffeine intake, such as from coffee. Because caffeine will be twice as effective when nicotine is reduced. Well, the caffeine effect that keeps you awake will tempt you to smoke. 5. Seek professional help like a psychiatrist, because cigarette addiction is usually a psychological addiction. It is an addiction where you have become accustomed to his smoking behavior, more than just a nicotine addiction but a daily habit of having cigarettes in it. This should be handled in a professional manner to know your triggers and encouragement to smoke. 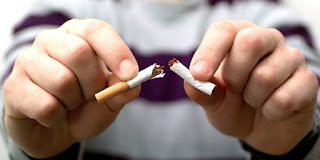 To quit smoking, there are two methods that can be used that is how to stop smoking suddenly or in western culture called "Cold Turkey," as well as how to stop smoking gradually. Here are tips and how to stop smoking gradually. 1. Determine how long you will take this gradual method, and commit to your decision. Suppose you want to gradually stop within 3 weeks, then mark your calendar and do not get to the date where you should have stopped, but you are still touching a cigarette. 2. Begin on a less busy day, not potentially stressful, or during holidays. If you start gradually to stop smoking on a Monday full of deadlines, you will be tempted again to smoke. 3. Determine specifically how many cigarettes you reduce. This determination is quite simple. For example one cigarette in one day, or one trunk two days. The number of cigarettes must necessarily decrease over time, where at the end of the deadline to stop smoking, you should definitely stop. For example, first week 7 cigarettes a week, second week 3 stems, third week 1 rod, next week stop completely. 4. Combine this gradual stopping way with counseling to a professional pskiater, or to a close friend of yours who cons in your smoking habits. This will give you even more encouragement to stop. As is common knowledge, quitting smoking is not an easy matter. How to stop smoking is a lot, but that does not mean it is easy to do. Can not be denied, to take a way to quit smoking is natural and also fast, only one key, namely motivation. Motivation to stop smoking should be there long before you actually stop. The reason this is what will later prevent you to re-consume cigarettes. Of course the reason to quit smoking is very much, especially about health. But you should think about how the health of people close to you and your loved ones, which is exposed to the effects of passive smoking cigarettes. It would be very painful if the person you love has a particular disease because of your behavior. In addition, smoking itself has adverse effects in the long run. Quitting smoking will be good in the future, because who knows you will be the backbone of the family and will be very detrimental to the family if you get sick from smoking. So make a list of reasons that can change your life when you try to quit. Make specific or simple reasons such as "I want to quit smoking so I do not get tired when playing futsal with kids," or "I want to quit smoking so as not to go around with my hobbyist wife up the mountain," and many other reasons. So determine your most powerful and potentially life-changing motivation to quit smoking. Cigarettes are dangerous objects that should be shunned consumption, especially by pregnant women. If a pregnant mother smokes, the fetus will have a risk of exposure to millions of toxic chemicals. This will trigger complications such as premature birth, and low infant weight. More details, carbon monoxide contained in cigarette smoke can inhibit oxygen flow and nutrient intake in the fetus. This oxygen limitation necessarily slows the baby's breathing and spur the throbbing heart much faster than it should. 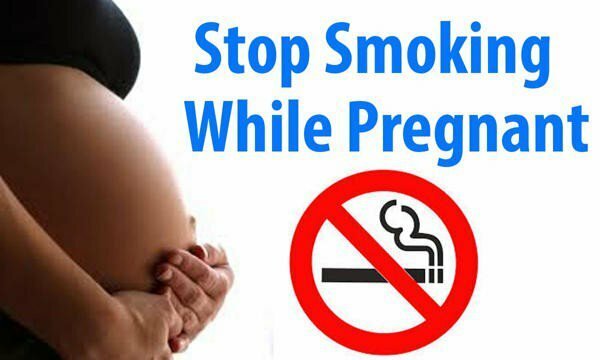 So, no need to take a convoluted way to stop smoking, quit smoking right now if you're pregnant! Smoking when you're pregnant is not only harming you, but it's harmful to the baby you're pregnant with. Remember that your child is entitled to a better quality of life without exposure to nicotine, even before he inhale the fresh air of Earth. 0 Response to "How to stop smoking fast, safe, and permanent"